Tony Lawrence's Coins & Stuff: What makes a PR69DCAM not a PR70 DCAM? The difference between a PR69DCAM coin and a PR70 DCAM coin is not very much. Sometimes it is really just a matter of opinion and sometimes sending a 69 back for reconsideration will cause it to come back as a 70. In other cases, the defect is obvious. Here is one of the PR69's I recently got back from PCGS. Do you see the dark spot above the "D"? In this photo, it looks like it could be a piece of thread or dust, but it really is on the coin. So is the other spot above the "T". Other 69's aren't so easy to see. 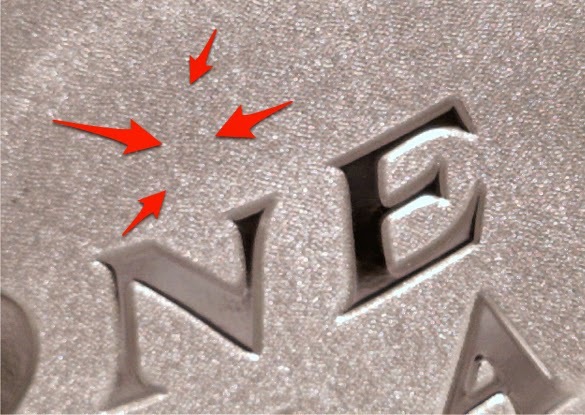 In these coins, the defect appears as a reflective spot, but you need to tip the coins to see the spots and they are very hard to photograph. Just below "L", above "in"
Below "L", above "i" of "in"
But then there is this one. I've tipped this every which way under a light. I've looked at it with a 5x glass, a 10x and even 20x. I enlisted the support of my eagle-eyed, highly attentive to detail wife. If I have the slightest spot on my clothes, she'll see it. She can walk into the living room and point right at the one tiny spot I missed when dusting. I showed her the 3 PR70's and the 69's where I had been able to pick out a defect. She agreed with me about those and didn't need a magnifier. Then I showed her this coin. She looked at it, hesitated, and looked again. She asked for the magnifier. She tipped it and turned it and sighed. "Wait! I see it above the stitches! ", she exclaimed. I handed her the two PR70's. She examined those and decided that no, what she saw must be intended to be on the coin. She spent a few more minutes. "There's a tiny, tiny vertical line above the "N" of "ONE DOLLAR", she announced. I took the glass and the coin back, but could not see it. "It's there", she said. "You have to tip it just right, but it's there." I looked again. I could not see it. I tried the 10x loupe again - I saw nothing. 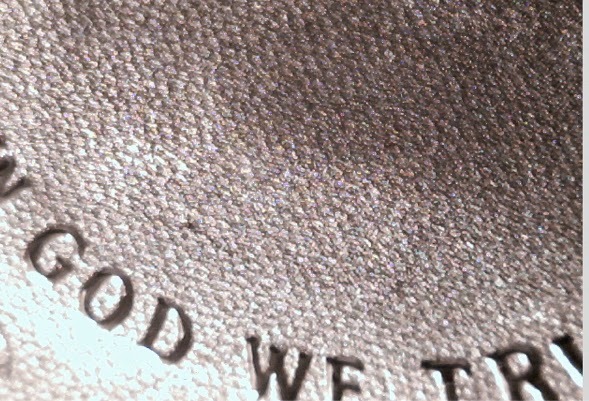 Finally, under 20X magnification and with some adjustments to the lighting, I was able to faintly make out this mark. That must be it, because neither of us can find anything else!